I am not a violent man. But I have had it up to here! I can’t stand it anymore. I want to invite every reader to join me in a conspiracy to commit murder. It has insinuated itself into our lives. Eating away at our brains. Putting us on the defensive, chipping away at our self-esteem, confusing us into pointless pauses, enslaving us into just trying to get it right. Admit it. You were looking at the salutation of this post and thinking about it, weren’t you? Who grew up speaking it without special education? Who comes upon it naturally in daily speech? Who did this to us? Let’s face it. The quadratic equation is rare but particularizes something useful. Hegemony is a rare word but distinguishes something useful. The Pythagorean Comma is rare but occasionally it’s useful, for a few specialists. What use is whom? What real difference has it ever made? Yeah, yeah, it distinguishes the object from the subject in a sentence, but who friggin’ cares? When has there been a real lack of clarity when it’s missing in common usage? Sure, you can construct an example sentence to show a possible ambiguity, but who would say such a thing? By who would it be said? Let’s be assassins. 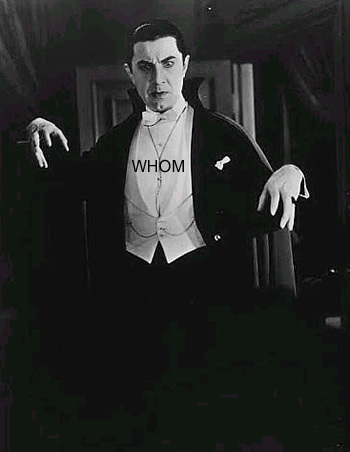 Let’s stake this grammatical vampire in its academic black heart. Die, die, die, die, die, haunted thing that should have decayed centuries ago. This entry was posted in 07. Language and Rhetoric on November 5, 2014 by Mark.